Tired of run-of-the-mill “summer” beers? Looking for other refreshing options for your Independence Day celebrations? Why not seek out some sour beers? Sour beer has an image problem. Or rather, it has a naming problem. When gushing about a brilliant sour ale to non-Alehead friends, the usual response is a wrinkled nose and the words “yuck” or “weird”. Beers aren’t supposed to be sour. They’re supposed to be malty and bitter…not tart and acidic. That assumption is a damn shame since sour beers are one of THE best ways to attract skeptics to the craft beer fold. Sours can be an exceptional gateway for those people that shy away from the rich, redolent flavors of Imperial Stouts or the over-hopped bitterness of IPAs. They’re generally light-bodied, have low alcohol-contents, and are extraordinarily refreshing. Got a woman in your life who claims to hate beer? Give her a lambic. How about an oenophile friend who couldn’t imagine drinking anything but wine? Try a Flanders Red. It all comes back to that naming problem. The word “sour” immediately brings to mind something spoiled or past its prime. “Sour beer” just sounds like something you left open on the radiator for too long. You wouldn’t drink “sour milk”…but everyone loves yogurt and cheese. And you wouldn’t drink “sour wine”, but who doesn’t enjoy the bracing acid of vinegar on your salad. Unfortunately for Aleheads, the “actual” terminology for sours (Lambic, Gueuze, Oud Bruin, etc.) are either too obscure or too difficult (i.e. “foreign”) to pronounce. So we’re left referring to “sour beers” in a generic sense…and that’s when we’re met with those wrinkled noses. Me? I love sour beer. Love it. As recently as a few years ago, the only easy-to-find sours were Belgian imports like the inimitable Rodenbach. But during the recent craft beer explosion, American brewers have recognized that the challenges inherent in developing a sour program at their breweries were worth tackling. In fact, sour beers are often seen as a true test of a brewer’s mettle. Why? What makes a sour beer “sour” and why are they so damn difficult to make? Any style of beer could technically be “soured”, but in reality, the sour beers we generally see are classic Belgian styles like Lambics and Gueuzes. There’s a simple reason for this…the Belgians have been playing the sour game a LOT longer than anyone else. They’ve mastered many of the nuances of sour programs (although even Belgian brewmasters would admit that making sour beer is still a matter of some luck). Many American brewers looking to wander down the sour path have contracted with or had intense discussions with Belgian brewers. When you’re talking about something as unpredictable as a sour program, it just makes sense to lean on breweries with decades of experience in making them work. So how DO beers become sour? In a nutshell, you go “old school”. *Although, some breweries, like Allagash, have revived the risky methods of open fermentation. A few years back, Allagash installed a “coolship”…a long, shallow vessel that resembles a giant bathtub. Wort is poured into the vessel and then allowed to cool by placing it near open windows. Whatever yeast enters the wort from the windows and the brewery itself are responsible for fermentation. It’s a crapshoot, but pretty awesome all the same. Today, brewers intentionally introduce wild yeasts and bacteria in a more predictable environment to try to create consistent results. The most common souring agents are lactobacillus, the bacteria responsible for making yogurt and cheese, pediococcus, the prime mover in making sauerkraut, and Brettanomyces, a notorious yeast strain that winemakers have nightmares about. Brett (as it’s fondly known) is the stuff of legend amongst brewers. It’s prized for the funky, wild, farmhouse aromas and flavors it adds to beer. But if used improperly, Brett can infect an entire brewery. Because of the potential for a global infection, many brewers won’t touch the stuff and winemakers treat it like bubonic plague. *Some Brett-lovers like Vinnie Cilurzo (the legendary brewmaster at Russian River) have noted in interviews that certain winemakers won’t even come to his brewery for fear of walking out with an errant cell of Brett on their clothes. The yeast is notoriously difficult to kill and once it has infected a surface, it’s essentially there forever. A barrel containing Brett yeast is all but useless for anything BUT a sour program. *That joke is for our one Orthodox Jewish reader. Shalom, Yossi! Aside from the risks of infection, sour programs also take FOREVER. Wild yeasts are unpredictable (hence the term “wild”) and can ferment very slowly. 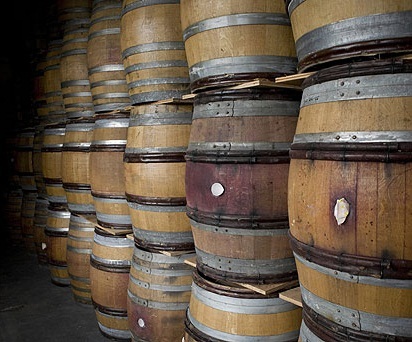 It can take months to ferment a sour beer properly and then years for them to mature in casks. A brewer can commit untold amounts of labor and capital into a sour program only to crack open his or her casks a few years later to find an undrinkable, vinegary mess. Of course, there are other ways to sour a beer. The easiest way is to add tart fruits like cherries and raspberries to the mix. Some breweries “cheat” the system by simply adding fruit during the aging process to kick-start secondary fermentation. But don’t assume that a beer with the word “Kriek” or “Framboise” (the Belgian words for “cherry” and “raspberry” respectively) are somehow inferior to other sour brews. In fact, some of the best sour beers on Earth combine traditional souring ingredients like lactobacillus with fruit additions. Cantillon, the famed Belgian lambic-producer makes some unearthly fruit beers. And Cascade Brewing’s Kriek is one of the all-time great American beers. *Oh, also because they make really good beer. *I should note that Vinnie Cilurzo at Russian River uses Brett liberally in his beers and yet always manages to produce highly-balanced, approachable offerings. So it certainly CAN be done, but if you ever find yourself drinking a sour that is simply too acidic or funky to stomach, it’s probably Brett’s fault. Even if you decide to pursue a sour program, you’ve got to know what kind of beer you ultimately want to produce. Do you make a simple, wood-aged, unblended lambic? Do you add fruit? Do you mix together lambic vintages to create a well-balanced Gueuze? Do you make a full-bodied and potently sour Flanders Red? Or a maltier, darker Oud Bruin? Do you run a careful, controlled sour program like Cascade? Or do you use a coolship like Allagash? Or how about Jolly Pumpkin‘s approach where Ron Jeffries lets the wild yeasts and bacteria running rampant through the brewery infect his beer from barrel to barrel? If that all sounds too risky, complex, and above all, insane to you, well…there’s a reason most breweries DON’T make sour beers. Let’s just be thankful as Aleheads that there are some brave brewers makin’ sours for all us sinners out there. The world would be a poorer, and far less interesting place without them. Bruery Oude Tart: Patrick Rue has developed one of the great sour programs of any small brewery in the country. His Oude Tart, a sweet and sour beauty, is a masterpiece. Cigar City Guava Grove: Cigar City nails every style they try, but I’m particularly enamored with their sours. The Guava Grove is almost frighteningly tart, but damn is it tasty. Hair of the Dog Michael: After a few years off the shelves, Hair of the Dog is bringing back their delicious Michael Flanders Red. Let’s hope it becomes a year-round fixture. Deschutes The Dissident: A massive Oud Bruin, The Dissident packs a 10.5% ABV punch along with its bold sour flavors. Not all sours have to be light-boded thirst-quenchers. Russian River Supplication: Oak-aged and cherry infused, the Supplication is a clear reminder that Russian River is about a lot more than just Plinys. Cascade Kriek: My favorite of the Portland-area breweries, Cascade’s beers are subtle, delicious, and carefully crafted. The Kriek is my favorite…a cherry-bomb of perfection. New Belgium La Folie: The La Folie is part of New Belgium’s experimental Lips of Faith Series which often delves into sour brews (see also: Le Terroir). The La Folie has a lovely, candy apple sweetness to offset the mouth-puckering tartness of the brew. Jolly Pumpkin Luciernaga: You could sub in any Jolly Pumpkin beer here. They’re all wild ales and they’re all amazing. The Luciernaga just happens to showcase JP’s mastery of sour ales as well as any. Allagash Confluence: Allagash’s coolship offerings are hard to come by unless you live nearby to the Portland brewery. But you can still get your hands on some of their sour offerings like the magnificent Confluence which showcases subtle differences in every vintage. Lost Abbey Red Poppy Ale: One of the hard-to-find prestige beers from Lost Abbey, the Red Poppy is a nigh-perfect sour beer. Complex and refreshing, it improves with every sip. These aren’t necessarily the best sour beers made in America, but I can promise you won’t regret picking up any of them. And perhaps once you’ve had a few from this list, you’ll join me in going forth to proclaim the glory and greatness that is sour beer to all who will listen. Embrace the power of sour, Alehead Nation! Posted in Beer 101.Tagged Allagash, Brettanomyces, cascade, Lactobacillus, Pediococcus, Russian River, Sour Beer, The Bruery. What would happen if George Amsinck ever met the BrewDog boys? Would his head explode? Would he beat them bloody with some old-timey, bare-knuckle fisticuffs? Something tells me I would have liked old George. Anyone so environmentally conscious that he creates a fermentation roof on top of his business is fine by me. Why bother with “green roofs” when you can have beer brewing above your head 24 hours a day? Has anyone tried making sour homebrew? I’ve seen brett yeast at Northern Brewer, but what is the risk of turning my house into a yeast lab if I use it? I have a sour program going on at the house. Have done probably 20 or so. I have not messed up any other beer through the sour program. Dedicated barrels, carboys, bottles, lines, growlers, and equipment all for the bretts. They’ve been great. Some can be ready relatively quickly (had one ready to roll in 2 months, while others have needed a year plus). If you have leftover wort, stick it in a growler and leave it out. Pellicle will usually get rolling in about 3-5 days. If you have a microscope, see what you’re working with and get the brett strain, build up a starter (multiple stages), pitch into next batch and you’re on your way. No need to buy. But if you do, Bruxellenis is the easiest to work with (you can also pitch dregs of some bottles). Cheers! The mad fermentationist has a list of commercial beers with bugs on his website. As Keith said, you should read The Mad Fermentationist’s blog for much information about making sours as home. I recommend giving sour beers three sips when trying them for the first time. When I toured New Belgium last March, they took us into the sour barrelhouse and the tour guide gave us La Folie to taste, insisting everyone try three sips. The first sip for the majority of our group resulted in horrorfaces. By the third sip, about half the group was finishing the tasters of the other half. Your tongue needs time to acclimate to what begins as a rather shocking taste. I’m still coming around on sours. I’m definitely more open to them than I was, say, two years ago, but I’m rarely blown away by them. On the other hand, I have had at least a few that I’ve thought were fantastic, so I will continue exploring. No, you’re right Mark. Brett in itself doesn’t really add a lot of sour character (though I find that all-Brett brews definitely have a distinctly tart “twang” to them). However, since SO many sour beers are created with some variation of Brett yeast, it’s nearly impossible to talk about sours without mentioning Brett. Personally, the first thing I think of when I hear Brett is “sour beer”, but you’re absolutely correct. There are many all-Brett beers out there that are far more on the musty, earthy side of the flavor spectrum rather than tart and sour. Northern Brewer had a cool video on making sours at home. One idea I really liked: Buy an oak barrel, fill with wort, get a good colony of Lacto/Pedio/Brett going, wait a long time, bottle some, add fresh wort to replace, repeat. A never ending supply of sour beer! I’m hosting a sour beer tasting at my home this Sunday. I expect about 20 sour beer fans to show up, and we’ll probably have 30+ different sour/wild/funky beers to taste. This is the third year that I’ve done this, and more people come every year. Nevermind I just realized this was yesterday you had the event! Ah reading posts thoroughly helps…. I live in Tucson. Yes, the tasting was yesterday. About 25 people came by, and we tasted over 30 different sour/wild beers. I hold this tasting every July, so if you ever want to come out for it, you have an invite. I’ve never had the Upland sours, but would love to try them.